But testing the truth of what appears obvious is kind of what science is all about, and the latest study, conducted by researchers from University College London and Duke University, set out to test whether telling small lies really did pave the way for telling larger ones. 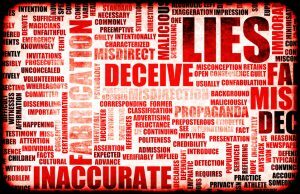 Scientist want to understand how and why small lies lead to bigger lies. Troubled managers want to manage the little lies and hope they don’t cascade into problems they can’t … lie their way out of. Now using the word ”lie” is a very emotional and politically incorrect practice. However in our attempt to be non-judgmental and not hurt anyone (as we would not want to be judged nor hurt nor be wrong in judging others) we often gloss over the typical … lie. Doing this just desensitizes the culture of the team or organization to these little misdirections. This can, not surprisingly, cascade into an environment where the lie (say in the form of an optimistic but totally nonobjective status report) becomes normal especially in organizations that are not doing well and are most in the need of management rigor to pull them out of their predicament. Increasing one’s honesty quotient in a place like these is scary and subject to being highly frowned upon and quite possibly, if not guaranteed, to be a career limiter. However if we really want to move the organization forward and upward then moving to brutal honesty is pretty much required. Of course it only seems brutal to folks who are not use to just conveying the objective facts. When I left the Air Force after 20 years my biggest shock in the commercial world was the use of obvious and blatant lies (often to save face, but also to undermine others, etc). Taking these organizations to more rigorous honesty often resulted in surprise (“you just want my real status?”) and often left some managers with a lot less to do when they no longer had to manage mountains of spin and misdirections. How well is your organization doing in avoiding or managing the little lies?